Quest for Healing - EBOOK A Story of LoveJoin Wendy on her inspirational journey as she seeks healing from the effects of her childhood diabetes. This is an inspiring story about miracles and the rekindling of hope…. Wendy spent much of her life looking for answers to the health issues caused by childhood diabetes, and because of this she discovered a wealth of knowledge in this area. She consistently recovered from health issues in ways that both confounded and inspired the medical community. After a major stroke, the medical community thought she would never speak again. But she went on to speak, write, walk, and live with passion and joy. With gangrene, things did not look good for her foot….but she found ways to heal and continue. With kidney failure, dietary factors played a significant role, but it was through a successful balance of thought, exercise, and happiness, that she was able to survive 20 years on dialysis. Wendy is living proof that anything is possible with Love, Determination, and Faith. By focusing mind, body, and spirit, she rediscovered the meaning of wellness. This is a story based on Wendys life. Names have been changed in order to protect identities, but the story itself is truth. The process of writing this book took more than twenty-two years to unfold. The author hopes that this book will show you how to fill your days with magic and laughter. She Believes in Magicby Dr. Andre Pickersgill, MD I have known Wendy for over ten years, as a doctor and as a friend. When modern medicine had little to offer her, she showed courage and strength beyond expectation. She achieved significant, verifiable improvements in her medical condition through diet, supplements, and faith. She has taught me much about respecting patient autonomy, and I have learned to expand my reality, and experience life more fully. Reading this book has provided a fascinating glimpse of the spirit inside this person dealing with more than her share of challenges. Revealed are the pain, despair, love and joy which make Wendy more real than most people I know. And the best part is...she believes in magic. Keep Reaching for Dreamsby Dr. Alastair Pirie Chiropractor, Cosmoneurobiologist It has been said, that courage is a special kind of knowledge, not the absence of fear, but rather the realization that something else is more important than fear. It can never be an easy task to keep reaching for dreams. Strength and courage can sometimes be lonely friends, but those who can reach, walk in stardust. Wendy is just such a being. In this difficult age we are experiencing on Earth, Wendy inspires us to broaden our horizons, to move out of our narrow reality tunnels and to embrace a model of life that is permeated by intelligence and wisdom far removed from the local and mundane. 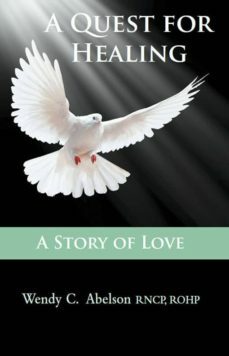 “A Quest for Healing, A Story of Love,” is a remarkable piece of writing revealed to us from the heart and soul of an equally remarkable woman. Wendy’s journey has been and will continue to be a source of tremendous insight for me personally as I too continue to try to contemplate and understand the intricacies of the mind-body system. Thank you Wendy!!!!! Wendy Abelson RNCP, ROHP is a registered practitioner with the International Organization of Nutritional Consultants.